The Wetmore Trail (which includes Tabletop Trail and Langes Run Trail) has been a bit “incomplete” until recently. Back in 2003, heavy flood damage closed nearly a mile of the trail and a fairly comprehensive restoration effort by the Conservancy was necessary to bring the trail back to hiking and equestrian shape. A 2013 Trail Management Plan was executed and pulled the section back in line with the trail corridor, which is anchored by the moderate Wetmore and Langes Trail loops. 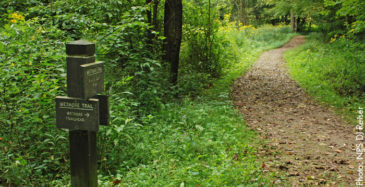 The whole Wetmore area is comprised of about 9 miles in total, but is part of 20 miles of equestrian trails that fortify this region of the CVNP—made up of old farmers paths and logging roads. From Peninsula, take Peninsula Rd. south to Akron Peninsula Rd., then to Wetmore Rd. (approximately 1.5 miles), then turn left on Wetmore Rd. In approximately a half-mile, parking will be visible from the road. Versatility. This is a multi-use section of the CVNP, and hikers, snowshoe enthusiasts, and equestrians all get major use of the trail system here. The trail is irregular, somewhat “mixed-media,” with gravel, clay, dirt, hills, and slopes, and is narrow in spots. Be sure to yield to bridal-equestrian traffic: they have the right of way! What’s more, irregular trails and changing elevation offer a moderate challenge that vary with weather and various seasonal conditions. Hikers, snowshoe fans, horseback riders and the like are bound to love the adaptable, multipurpose terrain here. This trail system has a tendency to never be the same twice. Several visits can yield completely different traction experiences.